The first Pillar of Islam is called Shahadah. It is the worship of Allah(god)alone. 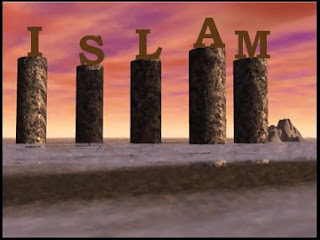 The fourth Pillar of Islam is called Sawm. This is the fasting during the month of Ramadan for thirty days. During this month all Muslims fast from drink, food, and from sexual relations with their spouses. This is a time for self purification. If someone has to many health problems during this month they can make up the days that they break the fast later in the year if their health allows them to. The fifth and final Pillar of Islam is called Hajj. The hajj is a pilgrimage to Mecca at least once in a Muslim's lifetime. The pilgrimage is to the Ka'bah and other place including the hills of Safa and Marwa, then Arafa. "The rites of the Hajj include circling the Kaaba seven times and going seven times between the hillocks of Safa and Marwa, as Hagar did during her search for water. Then the pilgrims stand together in Arafa5 and ask God for what they wish and for His forgiveness, in what is often thought of as a preview of the Day of Judgment."